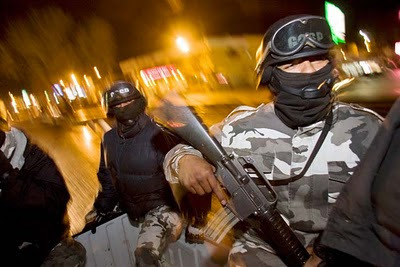 A special unit of the Nogales, Sonora, Mexico, police department, conducts an anti-drug and gang sweep through the city. The folks over at PhotoShelter, did a blog entry this week on the world’s most dangerous places for photojournalists. I was flattered when they asked me to contribute my thoughts on working in Mexico, which came in at number eight on the list. I’ve worked a lot in Mexico, in many places throughout the country, on stories about immigration, agriculture and traditions. I always had a great time and was touched by the warmth of the people I met there. It breaks my heart to see what the drug wars have done to the country. The PhotoShelter blog entry has subsequently been picked up by other photography blogs (which also used one of my photos). PhotoShelter is a great organization. My archive has there for years and I recently moved my entire web site over to PhotoShelter.